I listened to this recording several times before I learned anything of the project leader and composer behind it. I must admit I was at first a tad bemused. Before my ears was a series of short, cartoon-esque tunes, but amid the caricatures were glimpses of deep, gritty improvising. It was tricky to know how to listen to this curious recording – part parody, part jazz. The picture came into focus when I learned that Peter Dasent, the man behind the music, is a composer for film and resident pianist on a much-loved Australian children’s television program. Here was the explanation for the chamber-like approach to the compositions on the album and the sense of zaniness that pervades it. This is a good framework with which to listen to Lounge Suite Tango: it is not a hard-hitting, cutting edge contribution to the jazz canon, but quirky chamber jazz. This is in line with the origins of the band: The Umbrellas started some thirty years ago as a chamber ensemble that included elements of improvisation. Quirkiness abounds on this album, as demonstrated by the title track and Quick March. These madcapped ditties are reminiscent of Stravinsky’s short pieces for small orchestra. Other pieces on the album (Lost at Sea and Bendix, for example) have a little of the ‘exquisite corpse’ about them, in that their sections, while contrasting, relate little to each other and come across as somewhat disjointed. It’s been 15 years since Peter released an album under the banner of The Umbrellas, and the personnel has changed significantly in that time. Peter has chosen his associate artists well in this instance and their strength as improvisers lends this recording real ‘street cred’. Trombonist James Greening is generosity incarnate. His felicity is palpable here and his playing of the pocket trumpet on Lost at Sea is, in its expressivity, surely the envy of many who play only the trumpet. 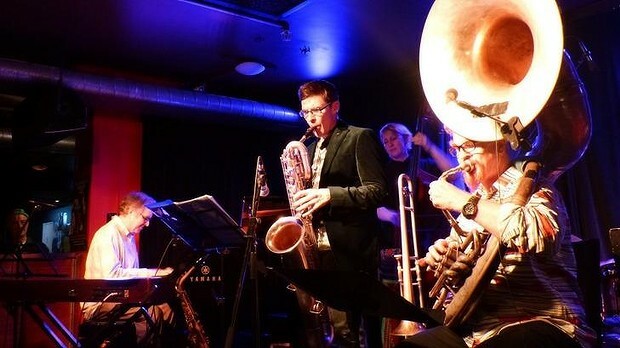 Drummer Toby Hall and saxophonist Andrew Robson also bring tremendous energy to Lounge Suite Tango: Toby sounds like two drummers on Quick March, and Andrew’s interpretation of the melody on Ernie’s Green Bucket is stretchy and gooey in all the right places. Zoe Hauptmann connects well with Toby, and handles some tricky written lines with aplomb (see particularly the title track). I get the sense that her sound has been slightly misrepresented here by an overemphasis of DI signal in the bass blend. Founding member of The Umbrellas, Andrew Wilkie is inconspicuous in his accuracy and ability to connect with the time feel generated by Toby and Zoe. I wonder if Lounge Suite Tango has been something of a labor of love for Peter, whose profession perhaps does not provide a great deal of opportunity for him to write the music that he really wants to write. Good on him for getting it out, and good on his associate artists for bringing themselves so completely to the party. 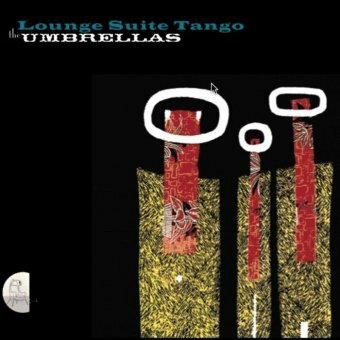 While Lounge Suite Tango is not about to take out the Bell Award for best avant-garde album, it is a really approachable chamber jazz recording, imbued with moments of wonderful energy by some of Sydney’s finest jazz musicians.